Cut peppers in half, remove seeds and membranes. Rinse peppers under cold water. Place peppers in a large pot; cover with lightly salted water. Bring to a boil; reduce heat, cover, and simmer for 5 minutes. Drain peppers and set aside. Heat olive oil in a large skillet over medium heat until hot. Saute chopped onion, and chopped celery for about 5 minutes, or until vegetables are tender. I like to add a little bit of chopped bell peppers to the mixture if I have extra around. Add tomatoes, tomato paste, water, crushed garlic, basil, 1 teaspoon salt, and 1/4 teaspoon of pepper. Simmer for about 10 minutes. In a large mixing bowl, combine the egg with remaining 1 teaspoon salt and 1/4 teaspoon pepper, and Worcestershire sauce. Gently stir to blend; add ground elk, cooked rice, and the tomato mixture and mix well. 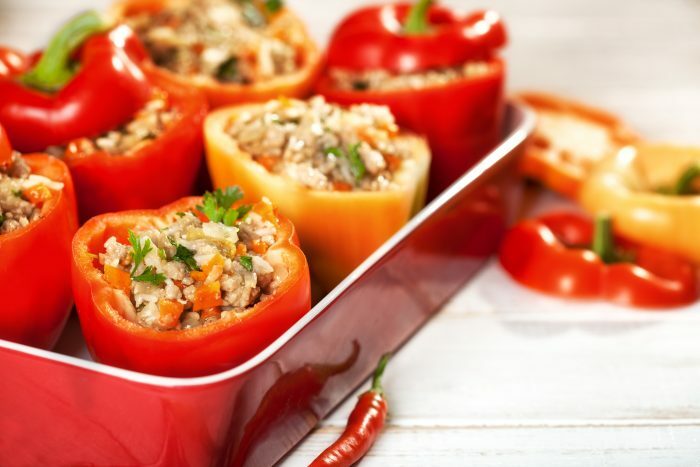 Stuff peppers with meat mixture and place in a baking dish. Bake at 350° for 55 to 65 minutes. Top stuffed peppers with a little shredded cheddar or pepper jack cheese just before peppers are done and bake until cheese is melted. Will you try this recipe? Let us know how it turns out! !